This is the tomb of a police officer, which is entered by a narrow flight of steps. In the main chamber Mahu is represented on all four walls carrying out his official duties. As we move anti-clockwise, we see him supervising the delivery of produce and lending an ear to his officials. 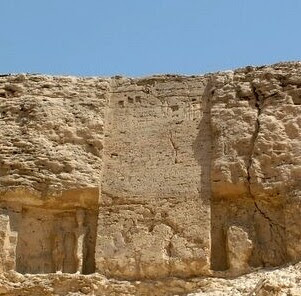 On the right-hand wall is a scene that starts at the centre and continues on the rear wall; it depicts the king and queen in a chariot being guided on a tour of the police quarters by Mahu himself. 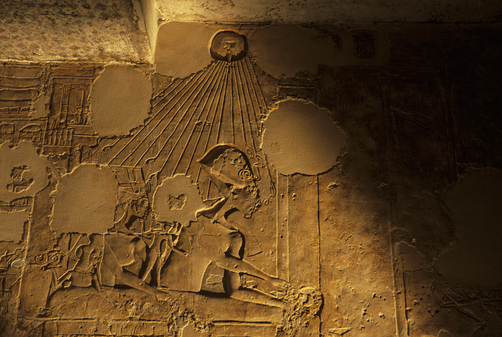 The scene, starting at the centre of the left-hand wall and continuing on the rear wall, shows men kneeling in prayer before the Temple of Aten. The deceased himself is in the lower register. At the top of the wall the royal couple drive from the palace, preceded by runners. Immediately below, we see them on the return journey.